Books About Strong Girls: Temple Grandin and Her Squeeze Machine! If your kids love books about strong girls who have overcome considerable odds to achieve lasting success, then you must read this fabulous nonfiction picture book biography, How to Build a Hug: Temple Grandin and Her Amazing Squeeze Machine! My poor Pickle. He’s one of the only kids in his kindergarten class who has yet to lose a tooth. Some of his classmates have lost not one, but mouthfuls of teeth! In our house, though, we don’t even have a teeny-tiny wiggle. Nothing. Nada. Zip. Not gonna lie — it totally bums him out sometimes, and he’ll stand in front of the mirror to examine whether any of them are finally wiggly. Thank goodness for Josie’s Lost Tooth, an adorable and oh-so-authentic new book by Jennifer K. Mann! It couldn’t have come into our lives at a more perfect time. In Josie’s Lost Tooth, Josie was always the kid in her grade to do everything first, but not anymore. Poor Josie is the only one who hasn’t lost a tooth. But, alas! One day, she feels a wiggly one! With every move she makes, she thinks it will be the move to knock that tooth right out. But nothing, absolutely nothing, works, until Josie plays sharks on the playground with Richard, and she trips and falls. And that trip? It does just the trick and knocks Josie’s tooth right out of her mouth. Her stumble does such a good job, in fact, that Josie can’t find her lost tooth anywhere! Whatever will she leave the tooth fairy now? Shark loving Richard comes to the rescue -- but I can’t tell you anymore without spoiling the story! Having a kiddo in the exact same position as Josie while we read this book made us love Josie’s Lost Tooth and it’s authentic main character so very, very much. Why? Because Josie’s Lost Tooth is one of those special books that speaks directly to kids without being didactic or preachy. It made Pickle feel so understood, so much more OK with the fact that he still hasn’t hit the milestone that so many of his friends have, and because of this he just loved it. He was mesmerized! Even better? The way Richard helps Josie when she can’t find her tooth, coming up with an awesome and incredibly thoughtful alternative to Josie’s plight. Richard’s action is such a touching addition to the story. It is simple yet gracious, setting a powerful example that generosity will always move mountains and kindness will forever be cool. Josie’s Lost Tooth gets two trunks up from our team, both for helping little ones who struggle with feeling left behind, and for simultaneously showing them that kindness rocks! Did you like this post? We are so glad! Check out these fantastic lists - we think you will love them too! Favorite Books About Friendship, Favorite Books About Love, and Favorite Books for Raising Kind Kids. You will also enjoy this grouping of books about doing good deeds! Want the book? Get it here! Josie’s Lost Teeth, by Jennifer K. Mann. HEE received a review copy of this book from the publisher, but all opinions expressed herein are entirely our own. Looking for an amazing picture book to read in anticipation of a big birthday? We’ve got just the book for you! Birthdays. Oh, the joy they bring for children! And, let's be honest, adults too! I hate being the center of attention, but I absolutely, wholeheartedly, love celebrating my birthday. I love the hope each new year inspires, I love wondering what I’ll achieve in the next 365 days, and I love, more than anything, making a birthday wish. Even better than my own birthday? Celebrating my boys’ birthdays. And guess what? We have one in our house this very week! And so it seemed like the perfect time to share this fun and fabulous new picture book, Ten Rules of the Birthday Wish, by Beth Ferry and illustrated by Tom Licthenheld. In Ten Rules of the Birthday Wish, we learn that there are ten, most definitely ten, “very specific, tried and true, and absolutely essential Rules For The Making of a Birthday Wish.” The most important? It must be your birthday, or close to it, obviously. Once rule number one is established, readers are escorted by a bunch of cheerful animals on a romp through the rules, ending with the last and most special one: a reminder that the word “wish” ends in “shhhhh” — so keep that wish quiet and dream about it coming true. So adorable! This irresistible picture book radiates fun. It brings birthdays and wish making to new heights, making both seem even more special, more exciting, and more impactful to the birthday boy or girl. Ten Rules of the Birthday Wish reminds us of the joy deeply rooted in a day dedicated just for us, as well as the hope and magic inherent in thinking of, and then making, a wish. Whether big or little, a “now” wish or a “future” wish, there is nothing better than knowing that wish is all yours, and only yours, to dream into fruition. This book is SO much fun, especially when you share it with your kids in the week leading up to their birthday! Pickle was grinning and giggling the whole way through, and he can’t stop thinking about that special wish he gets to make this week. One thing is for sure - Ten Rules of the Birthday Wish has become a new birthday week tradition in our house! Want the book? Get it here! Ten Rules of the Birthday Wish, by Beth Ferry and illustrated by Tom Lichtenheld. *This is an affiliate link. HEE received an advanced copy of this book from the publisher, but all opinions expressed herein are completely our own. Does your family have any special traditions incorporating books? Let us know on our Facebook page! If you liked this post, make sure to check these out too! 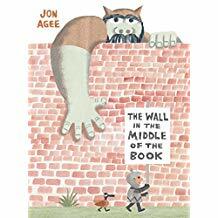 Favorite Picture Books of 2018, Favorite Picture Books of 2017, Favorite Books to Spark your Child’s Imagination. Oh my gosh, do I have a new favorite bedtime book! So you know I like funny books as much as the next one, but my heart is always with beautifully illustrated picture books (especially when they showcase our diverse world! ), lyrical writing and a plot that inspires wonder and imagination. And this is precisely why I fell madly in love with Time for Bed, Miyuki, by Roxanne Marie Galliez and illustrated by Seng Soun Ratanavanh. The book tackles a universal problem (I mean, do any of you not struggle getting your kids down at bedtime?!) and is set against an exquisite backdrop adorned with images depicting Japanese culture on every page. In Time for Bed, Miyuki, sweet Miyuki just doesn’t want to go to sleep, despite her grandfather’s pleas. Why? There are too many things to do, like water the vegetables, gather the snails and prepare for the arrival of the Dragonfly Queen. With gentleness and patience, her grandfather indulges Miyuki’s antics until finally, she is ready for bed and sleep overtakes her. Time for Bed, Miyuki is utterly captivating, both visually and lyrically. Children and parents alike will be enchanted by the story within the story, by the magical, detailed illustrations, and by Miyuki’s sweet and oh-so-familiar stalling techniques that so many kids employ night after night. It doesn’t matter where you live, bedtime for children around the world is always met with resistance! The tenderness between Miyuki and her grandfather shines and is sure to inspire the sweetest of slumbers as you kiss your little ones on the forehead and tuck them in for the night. A fun, whimsical beauty — my very favorite kind of book. Two trunks up! Want the book? Get it here! Time for Bed, Miyuki by Roxanne Marie Galliez. *This is an affiliate link. Thanks to Creepy Carrots, I will never look at carrots in the same way again. Seriously. Never ever again. 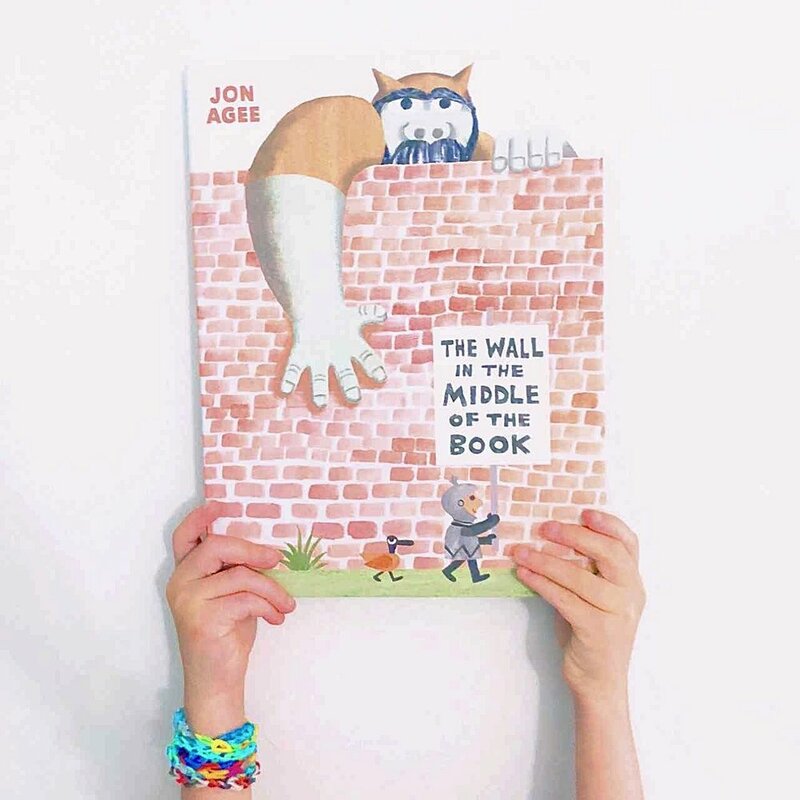 If your little one is not afraid of some dark humor or the slightly "scary" story, you've got to check out this fabulously quirky book, written by Aaron Reynolds and illustrated by Peter Brown. In Creepy Carrots, Jasper Rabbit's greed becomes his undoing. Jasper loves carrots, especially the ones that grow in Crackenhopper field. Jasper grabs carrots from the field constantly and can never seem to get enough of them-- until the carrots start following him - or are they? Is Jasper's imagination playing tricks on him, or are the carrots truly creepy-- and out for revenge? Creepy Carrots has got to be one of the most unique picture books in the world of children's literature. The color palette is dark and gloomy, perfectly setting the scene for a "scary" story. The gray and black scenes make the orange creepy carrots pop, and the illustrations provide a pretty terrific segue for discussing with little ones how art-- especially the selection and utilization of color -- can be used to evoke and convey different emotional experiences. I love how this story explores a child's well founded fears in such an original way. It gives the child's worries significant weight and attention, but then it puts such an unexpected twist on them that the reader is able to laugh about the story in the end, and, simultaneously, relive himself of some of his own anxiety. It helps kids look at situations from alternative perspectives, enabling them to understand that every so often, our fears may arise from some of our own behaviors- behaviors we may just have the power to change. Such a fun and unique read for your home collection! And for even more fun, make sure you get the sequel, Creepy Pair of Underwear. Mark my words — your kids will be obsessed! Want the books? Get them here! Creepy Carrots and Creepy Pair of Underwear, written by Aaron Reynolds and illustrated by Peter Brown. *These are affiliate links! I was tremendously close with my grandparents, and so it is that I have a tremendously large soft spot for books depicting intergenerational relationships -- or the ways in which a grandparent's legacy may impact a child's life, adventures or imagination. 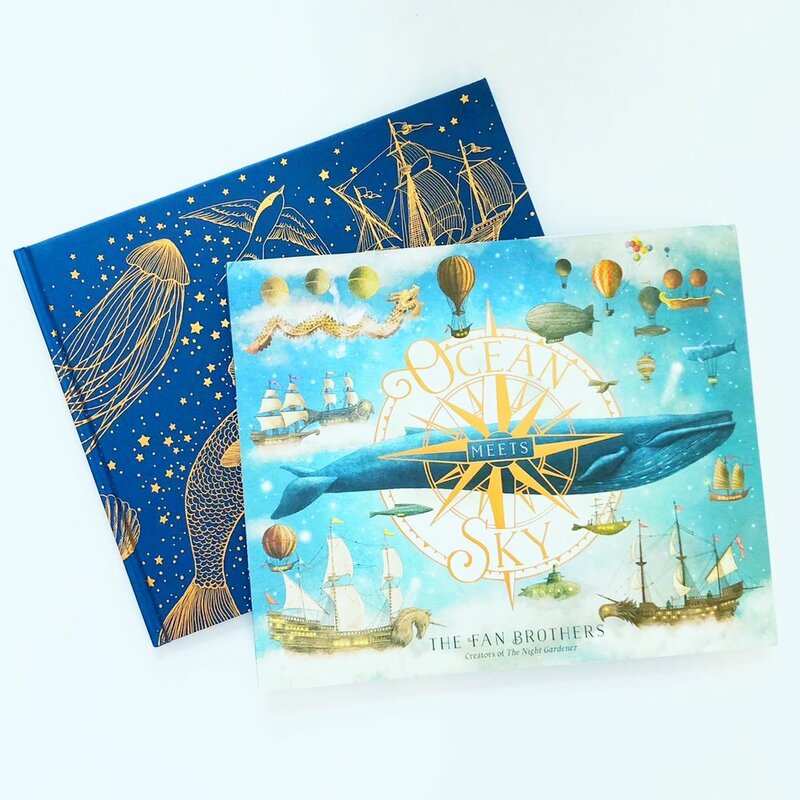 Ocean Meets Sky, the newest book by the indomitable Fan Brothers, is the most stunning ode to the love one young boy holds for his grandfather and the manner in which the boy chooses to honor his grandfather's memory. Oh, my heart! In Ocean Meets Sky, Finn decides to honor what would have been his beloved grandfather's 90th birthday by finding a faraway place he learned of from his grandfather's tales - the magical space where ocean meets sky. Finn builds a boat as he had planned to do with his grandfather, preparing to set off on his journey. Before he leaves though, he falls asleep in the boat. Finn awakens to find himself out at sea, and a massive golden fish discovers Finn and leads him to the precise destination described in his grandfather's tales. Finn is guided through one magical marvel after another, only to eventually be beckoned home by his mother's call. When he reaches the seashore Finn knows he's been transformed, and thanks to his grandfather, he experienced the most magical adventure. Ocean Meets Sky is as stunning in word as it is in illustration. Sparse text allows the exquisitely detailed pictures to impart much of the magic of the story. Reading this feels akin to being in a lush dream, where library islands ignite imagination and boats can take off for the sky. I love the premise of this story- of Finn’s longing to find the magical place known only from his grandfather’s stories, and the Fan Brother’s stunning illustrations will leave children not just spellbound and curious, but totally and utterly captivated. Watch your children and students marvel over each illustration and share their own ideas of what they see on these pages. Ocean Meets Sky will invite them in and grip them with its magic. Want the book? Get it here! Ocean Meets Sky by The Fan Brothers. *This is an affiliate link. HEE received an advanced copy of this book, but all opinions contained herein are expressly our own. What’s in a name? I’ve always loved that question. Sure, some parents pick names for one reason and one reason only: because they like the way they sound. But many of us pick our children's names for a reason: as a tribute to someone’s memory, to honor someone currently living, or because the name has a special definition we hope our sons and daughters will emulate. We picked our boys’ names for all of the above reasons, and their names- both their given names and their Hebrew names- are so special to our family. Because I love the derivation of names, I particularly loved Alma and How She Got Her Name, by Juana Martinez-Neal. This book is simply perfect - and absolutely stunning to boot!! It’s no wonder it was awarded a 2019 Caldecott Honor! In Alma, a little girl complains to her father about her long name -- Alma Sofia Esperanza Jose Pura Candela. “It never fits,” she tells her Dad. Her frustration prompts a discussion between father and child as to why Alma was given such a long name, and Alma's eyes suddenly open to the legacies she carries with her and the beloved ancestors she was named for. After Alma learns all about her vibrant name, she realizes that it may be the perfect fit after all. 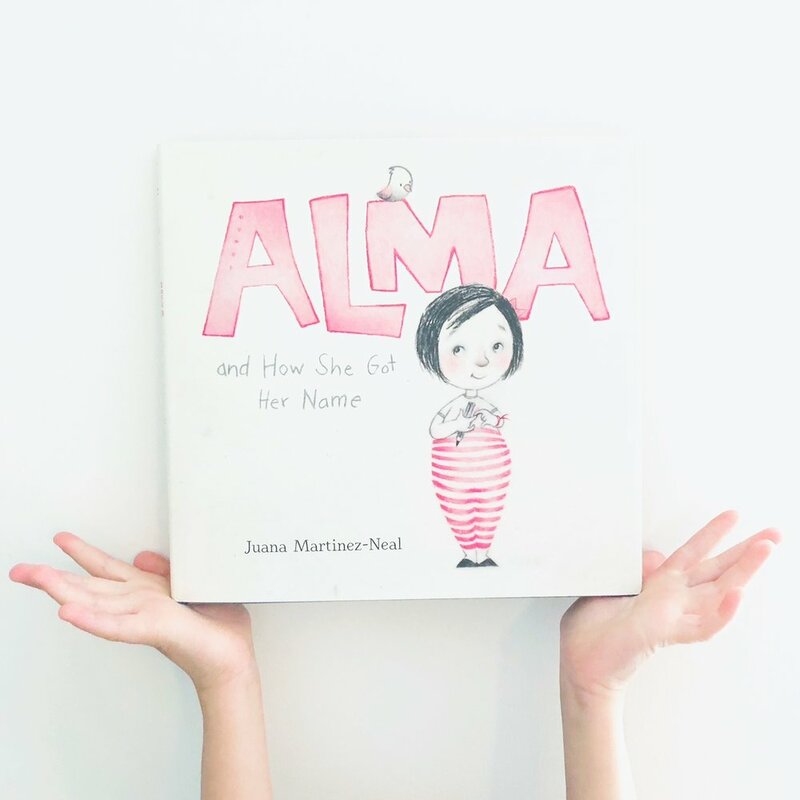 I am in LOVE with everything about this beautiful book: the story, the gorgeous illustrations, the reasons Alma comes to love and celebrate her name, and the way in which it lends itself to so many fabulous activities, either at home or in the classroom. Alma and How She Got Her Name is rich with activity ideas- from having children research the meaning behind their own names, to having kids learn about different cultural traditions for naming babies, to having kids write about the people for whom they were named and how they may emulate the characteristics of those people. The ideas are endless, and this beauty of a book is rife with possibility. Two trunks up for this stunning treasure, one that will stay with you and your children long after the final page is turned. For a full list of the ALA awards, including the prestigious Caldecott, Newbery, Geisel and Coretta Scott King awards, check out this post of all the 2019 winners! And did you know Alma made our list of Favorite Picture Books of 2018? Don’t leave without checking out that post here! Want the book? Get it here! Alma and How She Got Her Name, by Juana Martinez-Neal. *This is an affiliate link. HEE received an advanced review copy of this book, but all opinions expressed herein are entirely our own. How many of you have kids who so desperately want to help you out with something ... but instead of helping, they end up creating total chaos instead? And then you don't know whether to laugh or cry -- laugh because the mess they've caused is just so awful that laughing is the only way to keep you from yanking every last strand of your hair out, or cry because it really is THAT AWFUL and you want someone else to fix it so you can simply slink to the ground in defeat? Sound familiar? If so, then Edie is Ever so Helpful, the latest by Sophy Henn, author-illustrator extraordinaire, is a must for your collections. In Edie is Ever so Helpful, sweet Edie is helpful to everyone around her. In fact, helping is one of the things she is just the best at! Edie is all about using her voice, helping in the kitchen, making sure all the kids are having fun on the playground, and gathering everything her Daddy needs at the grocery store. Every once in a while, though, she may need a bit of a reminder that sometimes, she doesn't need to be quite so good at helping others. If you want a book that is as charming as it is, well, helpful (no pun intended), Edie is an absolute must. Sometimes the manner in which our kids and students want to assist us simply isn't helpful at all, but it is so challenging to explain this to a little one. Edie is Ever so Helpful is the perfect book to have on hand when you need to gently tell your kids that their way of helping may not be exactly what you need at the moment, but they are no less loved and appreciated for their attempts. 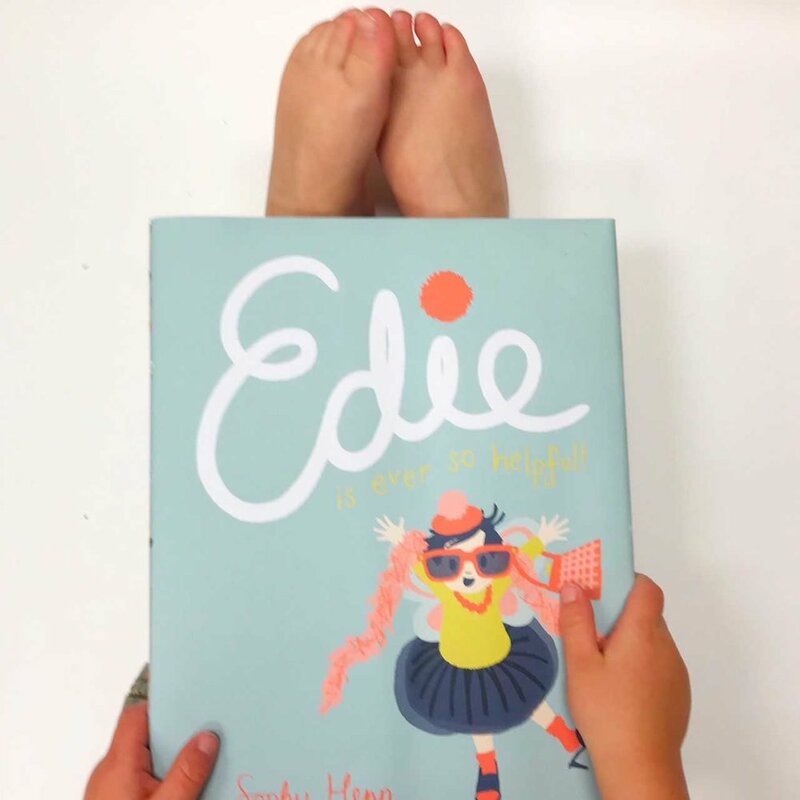 When you pair this message with Henn's whimsical art that allows kids to recognize through illustration how Edie's actions may be anything but helpful, you've got an instant winner. Two trunks up! Want the book? Get it here! Edie is Ever So Helpful, by Sophy Henn. *This is an affiliate link. HEE received an advanced review copy of this book, but all opinions contained herein are expressly our own. It's Wednesday, and I decided to join in the #wordlesswednesday fun today, because I have some new gorgeous wordless books that I can't wait to share. I know, I know. Wordless books can be intimidating, no doubt. But a good wordless book is worth its weight in gold. Why? With no words, children have to study the illustrations to pick up on story elements. They use their own language to tell the story, and they experiment with beginnings, middles and endings. Through details in the story, kids pick up on important tools such as emotions, weather, and catalysts for particular actions taken by the characters. And most importantly, kids are able to use the powers of their own imaginations in connection with the illustrations to tell their rendition of the story. Wallpaper, by Thao Lam, is an absolute wonder! This is the story of a young girl who moves with her family to a new home. Outside her window, the child sees some other kids her age in a treehouse, but she is too scared to say hello. With nothing else to do, she picks at a torn piece of wallpaper in her room, and a fantastical journey suddenly ensues. What happens when she discovers a monster on her journey? She's scared, of course, until she realizes the monster simply needs a friend. And he may be just the creature to give her a hefty dose of courage to survive her new circumstances. If you are new to wordless books, Wallpaper is DEFINITELY one to begin with -- and I don't say that lightly. The collaged illustrations, to start, are breathtaking. Wallpaper also has a clear beginning, middle and end, making it easy for kids to explain what they believe is happening. More importantly, however, the illustrations are concrete enough to give important context, but whimsical enough that kids can be creative with the story. Wallpaper is a unique, and uniquely beautiful, approach to the classic subject of making friends, and I cannot wait to share this one with my students. Want the book? Get it here! Wallpaper, by Thao Lam. *This is an affiliate link. If you are interested in additional wordless books, make sure to check out our reviews for these fabulous options: Wolf in the Snow by Matthew Cordell, The Farmer and the Clown by Marla Frazee, and Pool, by JiHyeon Lee. I always wanted a treehouse as a child -- a treehouse with a staircase to the sky, where I could watch the world like a robin, read my books, and write my stories. It never happened, though. The swaying palm trees in our backyard weren't the most conducive for such a hideaway, my parents told me, so I had to resort to reading about them instead. Oh, how I wish I had Everything You Need for a Treehouse back then! It would have been the perfect antidote for my treehouse-less backyard. Why? Because it is just as magical as I imagine the real thing to be. Magical and mysterious and, no ifs ands or buts about it, absolutely perfect. In Everything You Need for a Treehouse, lyrically written by Carter Higgins and exquisitely illustrated by Emily Hughes, readers are given "instructions" on what they need to build a treehouse, beginning with time, a look up, and a hefty imagination. The book breathes life into each and every requirement for the house - from gnarled timber to making sure it's tall enough to see sun speckles up close, to a swing and rope and "twisted twine of spun sugar and sap." Together, the story and illustrations sing. Together, they spark magic, ignite imagination, and capture the enchantment and wonder a treehouse rouses in children and adults alike. Everything You Need for a Treehouse is genius. It's cadence is impeccable, making it a read aloud gem for storytime. The language and vocabulary is challenging yet accessible, so it works just as well for older elementary children as it does for the younger set. The illustrations are unbelievably breathtaking, with details to pore over on every page. And the lyrical prose reads like a dream, one you want to immerse yourself in again and again. Simply put: I may not have had a treehouse as a child, but, my goodness, I certainly do now. Everything You Need for a Treehouse is pure picture book perfection. Without a doubt, this is my favorite release of 2018 to date. Don't walk, run to the bookstore to get this beauty today! Want the book? Get it here! Everything You Need for a Treehouse, by Carter Higgins. *This is an affiliate link. HEE received an advanced copy of this book, but all opinions expressed herein are entirely our own. I love walking outside and feeling a gentle breeze on my neck. Even better, I love a blustery, drizzly day, when you can watch the wind whip leaves into a frenzy, all while snuggled under a blanket on the couch with a steaming cup of coffee in your hands. I never actually took the time to think about the wind though - especially how important it is to have structures or trees to break it. Not until I read Kate, Who Tamed the Wind, that is, the fabulous new book written by Liz Garton Scanlon and illustrated by Lee White. In Kate, Who Tamed the Wind, an old man lives at the tippy-top of a steep, steep hill where a strong wind blows and blows, turning his world upside down and leaving him throwing his hands up in frustration. What to do with all this wind that bangs his shutters and bends his boards and spills his tea? A young girl in an itty-bitty town at the bottom of the hill finds the man's hat that blew out of his house - and after hearing his cry of "what to do?!" carrying on the wind, she finds a solution, too. I am so in love with the way the prose in this book almost feels like the wind is blowing through the pages. The words are lyrical, the rhythm of the text is musical, and reading it aloud is pitch perfect. This is a beautifully illustrated, breezy story to read with students interested in or learning about ecology. But that's not all -- I love the way it explores friendship, problem solving, and ingenuity, too. Kate, Who Tamed the Wind is perfect -- not just for Earth Day, but all year round. Two trunks up! Want the book? Get it here! Kate, Who Tamed the Wind, by Liz Garton Scanlon. *This is an affiliate link. HEE received an advanced copy of this book, but all opinions expressed herein are entirely our own.